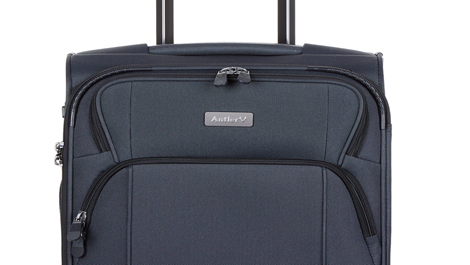 Last year, 23 million suitcases were mishandled or lost by airlines and airports. 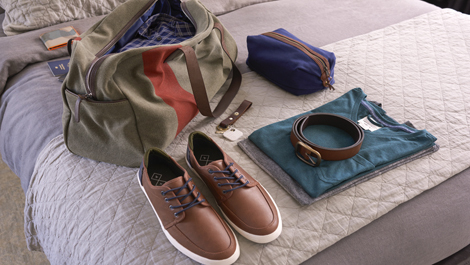 Here we review smart luggage and tracking devices designed to solve the problem. British luggage company Antler will soon unveil its Airstream 2 case, which comes with a unique ID label. Owners register their case on okoban.com, along with their contact information, so if the bag goes missing, whoever finds it can send an alert to them through the website with its whereabouts. USEFUL? Okoban says: “Your chances of being reunited with lost property are significantly improved” when using its system. It’s hard to tell if it would be any more effective than the airline baggage handling operations, which have their own procedures for getting your case back to you. If a stranger finds it in an airport concourse, for example, that is a different matter. Okoban has more lost and found offices in more than 2,200 airports. The suitcase is not high-tech in itself, but the label is a handy add-on that may come as standard on all cases in the future. Okoban also collaborates with Cabin Zero luggage, but the easiest option is to simply buy its ready-made tags and stickers for your valuables. One of the better examples of smart lugagge on the market, the Bluesmart is not only fitted with a global SIM card so you can track it from your smartphone visa GPS, but an in-built battery for charging devices, a digital lock and scale. The crowdfunded Bluesmart One is out now (US$449), while the Black Edition is coming soon. 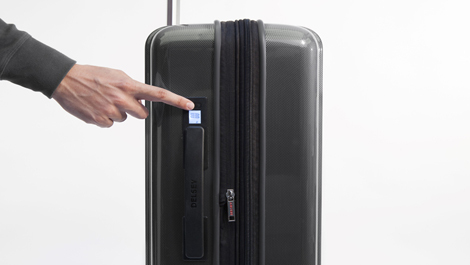 Set to launch next year, Delsey has offered a preview of its new smart Pluggage case, which has fingerprint recognition and tracking technology powered by Lug Loc luggage locator (also used in Samsonite’s GeoTrakR range). Business Traveller’s Marisa Cannon wrote: “Passengers will be able to download the Pluggage app, which will provide access to flight information and notifications of any changes. USEFUL? 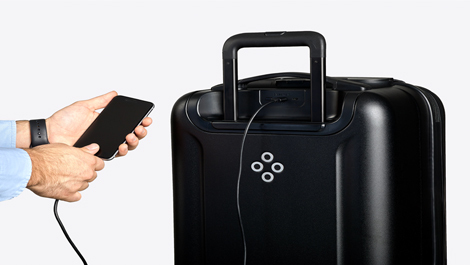 This sounds like an all-round smart suitcase with built-in tracking, monitoring and security features. An exciting proposition. Rimowa has created an electronic tag, whereby travellers can check-in their bag via smartphone app and then drop it off at the airport with no need to deal with staff or print out a sticker. The technology is built into “select” Rimowa suitcases, and sees paper tags replaced with “a digital data module to which the airline’s luggage data is transmitted”. At the moment, Lufthansa is the only partner airline that has started allowing passengers to use it, while United is in testing. USEFUL? It’s certainly nifty but won’t stop your case being lost. It will give travellers a pleasing sense of control, though, at least with regard to the check-in process. If you’re concerned your tag will disappear when the battery runs out, don’t worry, that’s not likely. Once the tag is displayed it stops relying on power. Samsonite unveiled new Track & Go technology in April that will be built into branded suitcases from the end of the year. Our online editor Mark Caswell wrote: “The Bluetooth beacon technology uses ‘Eddystone Ephemeral Identifiers’, an open privacy/security protocol developed by Google, and will work in conjunction with the Travlr by Samsonite app, allowing users to check the location of their suitcase within a 70 metre radius. USEFUL? The success of the technology will depend on the size of the community using the Travlr app. Samsonite says: “An important next step will be collaborating with airports and baggage handling companies to grow the network of fixed Bluetooth beacons in the vicinity of important travel hubs. This tiny Bluetooth tracking device recently launched in the UK – so far, US company Tile has sold more than 4.5 million of them worldwide. It can be attached to your keys or placed in your wallet or rucksack. To locate something nearby, you can actually ring it through the mobile app (provided you’re within the 100ft Bluetooth range), or open the map to see where you last had it. You can also press it to call your phone. USEFUL? Being small and cheap (US$25) this is a handy, low-cost way to keep track of your belongings, especially if you are forgetful. However, it won’t help if your suitcase is in Hong Kong and you are in London. TrackR’s coin-size tracking device works in a similar way to Tile. The product, which received US$1 million of crowdfunding, enables you to see your valuables on a map. You can also call them on your cell phone or use the gadget itself to call your phone. A distance indicator will show how close you are to your lost item (up to 100ft), while again crowd GPS helps you track worldwide. USEFUL? The Trackr Bravo is a little more expensive than the Tile (US$29.99) but works in a similar way. It’s available in four colours (silver, blue, black and rose). Again it’s not really designed for checking luggage on to a plane, and crowd-tracking relies on a certain volume of users to be effective. Last September, Tumi announced a partnership with US telecommunications giant AT&T and tech company LugTrack to create a new wireless tracking device called Tumi Global Locater. The idea behind the sleek palm-size device, which you pack between your clothes and pair with a smartphone app, is to provide travellers with real-time data on the whereabouts of their suitcases, through GPS, WIFI, Bluetooth and GSM. It’s also compliant with US Federal Aviation Administration regulations, shutting down automatically during flight, and coming back on after landing. You can set the device to “geotracking”, “plane” and “shipping” modes to get a reports whereabouts, while “hotel” mode will send you a push notification if your case has been moved from its “base” where you are staying. USEFUL? In theory, yes, but Tumi says: “Unfortunately the Global Locator is still not available and we don’t yet have a release date. However, each piece of Tumi luggage comes with an affixed metal plate bearing a unique barcode. This barcode is stored in the Tumi Tracer database, which can be cross-referenced with the owner’s name, address and telephone number.